Samsung's Galaxy Note II is happily filling hands in Korea and the UK without so much as a release date announced stateside. We may now have one, thanks to the folks at TmoNews, who appear to have snagged an internal document which suggests the phablet will arrive at the Magenta carrier on October 24th. Coincidentally (or not), Samsung is holding an event the same day, marrying with our previous speculation that it'll be unveiling the various carrier editions of the 5.5-inch beast there. Our suspicions are flagged, however, at the mention that Need for Speed: Most Wanted will come pre-installed, a game that isn't slated for release until October 30th -- not that we haven't seen similar release partnerships from the Note crew before. Although we can't confirm the legitimacy of this leak, we can suggest you start building up that grip strength just in case. 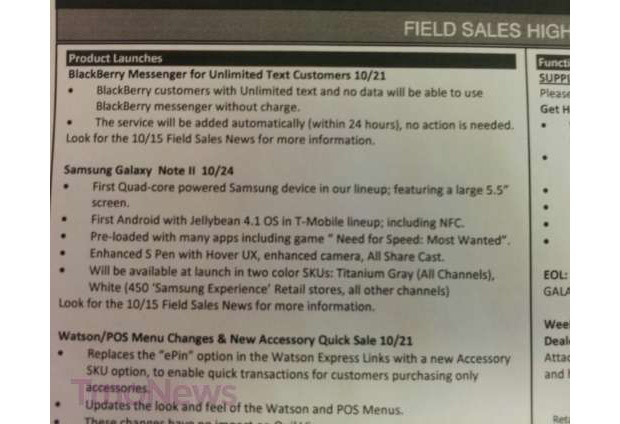 Galaxy Note II coming to T-Mobile on October 24th, say leaked documents originally appeared on Engadget on Tue, 09 Oct 2012 13:21:00 EDT. Please see our terms for use of feeds.